J.S. Bach’s five hundred mile return walk from from Arnstadt to Lübeck to hear Dietrich Buxtehude play the organ is well known. But, surprisingly, Buxtehude’s organ music is less well known. Which is why Simone Stella’s excellent new account of the complete organ music on six CDs for Brilliant Classics - currently selling for around £15 - is particularly welcome. 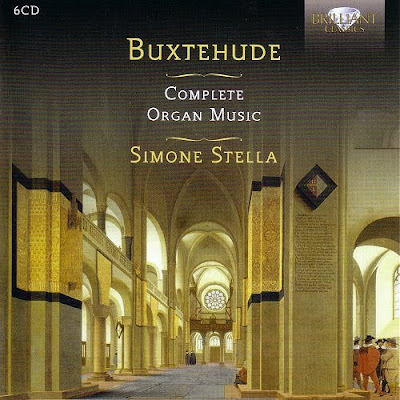 Dutch label Brilliant Classics built their reputation on canny licensing from major labels; but they now have a substantial new recording programme of which the Buxtehude set, which was recorded in 2011, is just one examples. Others include Simone Stella’s recording of Buxtehude’s complete harpsichord music, and of George Böhm’s complete harpsichord and organ music. The latter is a real revelation: a recently discovered manuscript belonging to Bach has proved that he studied with Böhm who lived from 1661 to 1733, and there are tantalising pre-echoes of the Well-Tempered Clavier in Böhm’s later suites for harpsichord. In this download dominated age it is strange that Brilliant Classics do not appear to offer downloads or Naxos Music Library streaming of their very impressive catalogue. I can only guess this is because they built their business on fixed term licensing deals for CD only, and as a result have not seen downloads as a priority. But for those who still value the sound quality, documentation and tactile appeal of CDs the Brilliant Classic bargain boxes are irresistible. In 2012 I mused on how unread books on your shelves look at you menacingly, and these Brilliant boxes have a similar if rather more friendly effect – they sit on the shelf imploring you to explore them. And back in 2006 I saw another organist legging it for Buxtehude in Bach's home town of Leipzig, read the story here. Just a wee clarification re the Naxos Music Library, Bob. I suspect the number of labels in the library will soon be around six hundred. Apart from Naxos' own labels, the foremost reason all these are in the Library is that Naxos is also a distributor, and all these are the labels they distribute. This explains why those particular labels are in there and why they cannot be downloaded. All circa 80 000 discs can be streamed, and as a link to the Library costs a modest annual fee (though you may get a free one thanks to the Toronto Symphony Orchestra), I imagine they have some sort of financial arrangement with the labels, either separate or part of the distribution contract. All this also accounts for the rather astonishing mix of labels, from the HMV catalogue, Nonesuch and Bis to a multitude of small labels specializing in particular eras or forms or in historical reissues. But downloading -- perhaps not impracticable, but for Naxos I should not think it financially feasible.